Almonds are the seeds, typically sold shelled, of the fruit of the almond tree, Prunus dulcis. Almonds are a source of protein, fiber, and fat (primarily monounsaturated). They also provide Vitamins E and B2 and manganese, phosphorus, and magnesium in significant quantities. There is some evidence supporting inclusion of almonds and nuts in the diet as a snack that helps regulate appetite and blood sugar. 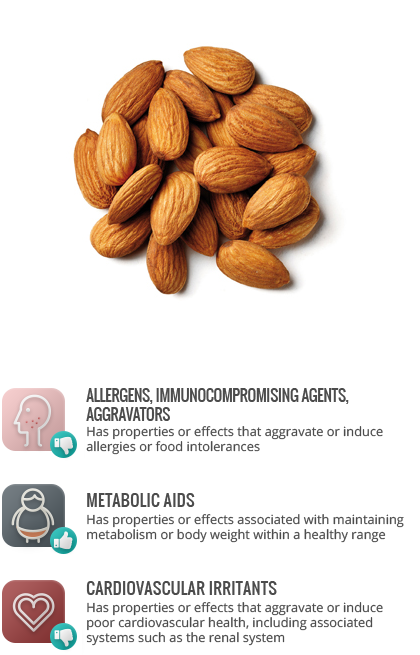 Almonds may lead to kidney stone formation in susceptible persons due to oxalate content. See: Almond oil. Almonds are often cross-reactive with tree nut and peach allergies and thus should be avoided by such individuals unless otherwise indicated.